For over 35 years, Fiesta Toy has been one of the world leaders and innovators in stuffed animals and plush toys. Their wide assortment of traditional and more unique stuffed animals encourages creativity and imaginative play with children, as well as providing a way for our children to share in the magic of the animal kingdom with which we share our planet. Fiesta's line of plush animals range from traditional teddy bears, plush dogs and plush cats, to the more unusual members of the animal kingdom - anteaters, emus, ferrets, porcupines, moles, and flying squirrels, just to name a few. A unique assortment of plush sea animals, such as sawfish, manatees, humpback whales, rays, and octopus provides stuffed animal fans with choices from oceans around the world. Life size stuffed animals, ride on stuffed animals, and rocking animals are also part of the Fiesta plush line, as well as Tales 4 Tomorrow, a new line of eco-friendly stuffed animals. As one of the largest plush toy manufacturers in the world, Fiesta cares about the quality of their product and your satisfaction with it. Their entire product line is subjected to rigorous testing to assure that all items meet CPSIA standards for safety, and all products are made of high quality, kid safe non-toxic new materials. 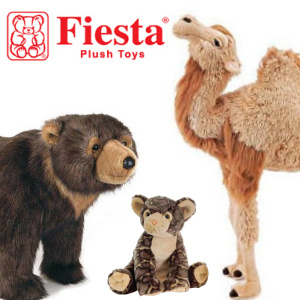 Stuffed Safari is proud to carry a large line of Fiesta stuffed animals, and we think you will enjoy them too. If you already own an Fiesta plush animal, you are familiar with how wonderful their toys are. If you haven't owned one of their products before, we invite you to browse their product line below!